After sweeping the one-seeded Toronto Raptors, the Cleveland Cavaliers had a rude awakening in Game 1 of the Eastern Conference Finals, as they were embarrassed by the Boston Celtics, 108-83. While Boston played very well, the loss is more on the Cavs for not executing. Cleveland’s team composition is to blame, and while that means its not a huge concern that they lost the first game of the series, it’s not exactly encouraging for their chances at reclaiming the NBA Title. This years Cavs team is obviously constructed around LeBron James and his ability to score effortlessly and create open looks for teammates. Kevin Love is a good second option and a matchup nightmare for nearly all NBA teams. After that, The Cavs have tried to fill the roster up with good shooters and solid defenders to space the floor and help James out. This structure means that in order for the Cavs to beat a good team like the Celtics, not only do James and Love have to play well, but at least two of the role players have to have solid shooting nights. During the first round against the Indiana Pacers, James was brilliant, but Love was ineffective for the most part. However, J.R. Smith, Kyle Korver, and Tristan Thompson stepped up in crucial moments, and the Cavs were able to squeak by. In the second round against Toronto, things couldn’t have been more different. James was again dominant, but he didn’t have to do everything by himself. Love scored nearly 20 points per game and averaged over 11 rebounds per night. Kyle Korver hit 14 of his 25 three-point attempts, and J.R. Smith sank 10 of his 13. Tristan Thompson wasn’t needed as much, because Kevin Love’s floor spacing ability drew both Jonas Valanciunas and Serge Ibaka out to the perimeter, which allowed James and others to get the the rim easier. But in the first game against the Celtics, the Cavs looked like a worse team than the one that was beaten three times by Indiana. Was it because of poor coaching and gameplan decisions by the coaching staff? No. The primary reason was an overall extremely poor shooting night by the entire team. For the first time this season, the Cavs did not make a single three-pointer in the first half. For a team that relies heavily on the three-ball, this was essentially a death sentence. Things improved in the third quarter, they tey still weren’t up to the Cavs’ standards. For the game, Cleveland went 4-26 from deep. James was 0-5, Love 1-4, George Hill 1-2, Korver 1-5, and Smith 0-3. This just cannot happen if the Cavs hope to win. James finished with a -32 +/-, the worst of his playoff career. In fact, the only Cavs player with a positive grade was Cedi Osman with =#; Osman went 0-3 in eight minutes of playing time after the Cavs had all but given up. While Cleveland played terribly, Boston was very good. Jaylen Brown, Al Horford, and Marcus Morris all scored at least 20 points, and Jayson Tatum added 16, while Terry Rozier led the team with eight assists. Boston led 32-11 at one point in the first quarter, and ended up winning by 25, even after the Cavs outscored the Celtics 29-17 in the third quarter. The good news for Cleveland is that a blowout of this magnitude likely won’t happen again. It’s highly unlikely that the entire team goes stone cold from the field in a game soon. Shooting 15% from three-point range and only hitting four deep-balls is not a recipe for success, and that was compounded by the Celtics’ efficiency. The bad news is that this weakness is not something that can be fixed. The Cavs are a team built of streaky shooters, and when those shooters are on a cold streak, it’s incredibly difficult for the team to win, even with LeBron James’ greatness. The Cavs will have a very tough time making it out of this series, and after that, the outlook becomes even bleaker. Both the Houston Rockets and Golden State Warriors are dependent on the three-point shot, however, both teams are far deeper and more consistent than the Cavs. 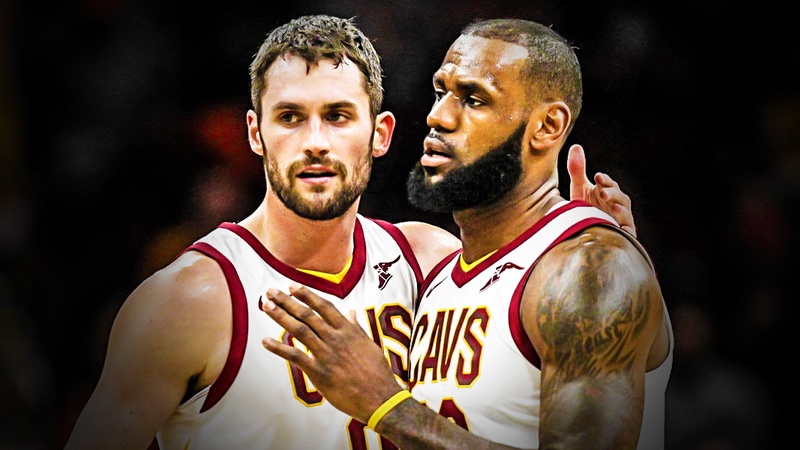 If Cleveland is to have any hope of beating either team in the Finals, they will need James and Love to be at their best, and at least three shooters to be hot per night. That can certainly happen, and it’s likely that even more will be hitting shots consistently during one game. But keeping that consistency during a grueling seven-game series is not the most likely scenario. Even if the Cavs are able to kick it into gear offensively, both the Warriors and Rockets may have too much firepower for Cleveland to overcome. It’s pick your poison with both teams; if you can manage to slow down one of their star players, they have more to replace the production. If Stephen Curry is having an off night, both Klay Thompson and Kevin Durant are capable of winning a game by themselves. The same goes for James Harden and Chris Paul, only the Rockets are even more versatile than Golden State, and Clint Capela is not a good matchup for any of the Cavs big men. We saw it all season long; there is no consistency with this Cavaliers team, and without Kyrie Irving, they don’t have the star power to overcome that fatal flaw. The team has the ability to go nuclear on any given night, but they would need to do that for a full series if they hope to win the NB Finals — and, unfortunately, it’s hard to see that happening.